When I had it 1st time, I wondered why is it called Gobhi '65' and not '19' or '22' or anything else??!!! And I google-d it to find out a reason, which confused me more n more as there are number of reasons given by people. i.e. Because it was a replica of Chicken 65! Some lady of 65 yrs invented this for his son! Original recipe had 65 different ingredients for making! n what not... Too funny, isn't it?? - Wash all the florets under tap water and parboil them for 4-5 mins. - Drain and rinse with cold water. - Mix plain flour, cornstarch, salt in a bowl and add water to get a thick batter consistency. - Heat oil in deep-frying pan. Once oil reaches smoking point, turn the heat to medium-high. - Dip each cauliflower floret in batter and slide 4-5 at once carefully for deep-fry. - Turn it around and fry till they are golden-brown in color and crisp from outside. - Take them out on absorbent paper to drain excess oil. - Mix cornstarch, soya sauce, red chilly sauce, salt and pepper powder in a small bowl. And make a slurry by adding water. - Heat 2 tsp oil in a stir-fry pan and add ginger paste, capsicum in it. 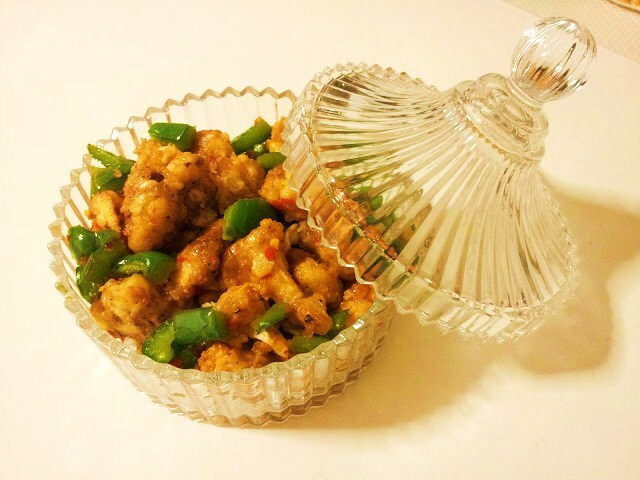 - Saute it for a while and add fried gobhi (florets) along with cornstarch slurry. - Mix well to coat all the florets with brown paste. Cook for a few seconds on high heat and serve hot!!! - Optionally, spring onion whites and garlic paste can be used added with ginger paste. - In that case, turn off the heat and sprinkle spring onion greens as well before serving.